Daily Cheapskate: Download free "Chametz Warnings"
Each year, I print out these "Chametz Warnings" for the chametzdik (not kosher for Passover) cabinets and closets that we have sold, and without fail, at least one guest asks me to please share the file with him/her before Pesach next year. Well, I've decided to share them with my friends on DailyCheapskate too. 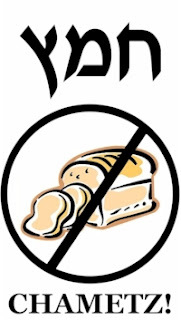 Download your free "Chametz Warnings" to cut out and hang on your cabinets and closets here.